A new agent, ColciGel®, has recently emerged for the treatment of acute flares of gout. ColciGel is a transdermal gel preparation of Colchicinum (colchicine in its homeopathic state) that is applied topically. ColciGel contains Colchicinum 4X in a proprietary Organogel that is applied directly to the site of acute flares. It is supplied as an airless 15ml container that delivers 0.25 ml of ColciGel® per pump. When ColciGel® is applied to the site of the acute gout flare, it crosses the dermal layer and reduces the inflammation and pain associated with the flare. With the topical application of ColciGel®, only minimal amounts of colchicine enter systemic circulation, reaching sub-clinical concentrations of <50 pg/mL. The combination of avoiding the gastrointestinal (GI) system and sub-clinical systemic circulation allows ColciGel® to avoid the tolerability and safety issues commonly seen with oral colchicine. ColciGel® patients report a 50% or greater decrease in pain and inflammation within a few hours and improved pain relief with additional applications. The typical GI side effects usually seen with oral colchicine have not been observed with transdermal ColciGel®. The primary goal in the treatment of an acute gout flare is the reduction in pain and inflammation. The current American College of Rheumatology (ACR) treatment guidelines for acute gout flares are clear in stating that the sooner treatment to reduce the pain and inflammation is initiated (within 24 hours of onset) the greater the response. Conversely, the longer the delay in treatment, due to waiting for physician appointment or attempting treatment with an ineffective agent (NSAIDs or oral colchicine), the less likely the patient will experience a positive outcome and often lead to further healthcare costs. The ACR guidelines for acute gout flares include use of non-steroidal anti-inflammatory drugs (NSAIDs), oral colchicine, and corticosteroids to achieve this goal. However, there are significant concerns with each of these therapeutic options. Most patients experiencing an acute gout flare will initially self-medicate with an OTC NSAID, either alone or in combination with another drug (ie, oral colchicine) and may not achieve significant pain relief. Many of these patients, most of whom are over the age of 60, will have co-morbidities such as cardiovascular disease which may preclude the prolonged use of high doses of NSAIDs due to the increased risk of heart attacks and strokes, as outlined in the Black Box warning for this drug class. Oral colchicine, though used for centuries to treat gout flares, is only modestly effective yet associated with a high degree of toxicity and adverse drug events. A clinical study in 2009 of high- and low-dose oral colchicine in treating gout flares demonstrated that the low-dose treatment was more effective and better tolerated by patients. With FDA approval of Colycrs in 2012, the low-dose became the only approved and indicated dose for treating acute flares of gout. The clinical evidence supporting low-dose oral colchicine was reviewed by van Echteld and stated that: “Based upon only two published trials, there is low-quality evidence that low-dose (oral) colchicine is likely to be an effective treatment for acute gout.”. The clinical trial of low-dose oral colchicine versus high-dose oral colchicine had 184 patients in 3 groups (placebo was the 3rd group) treated for 1 day. In the low-dose group, pain relief was achieved in only 38% of patients but was better than in the high-dose group (33%) and placebo (15%). Oral colchicine therapy was not effective in most of the cases with 62% of low-dose patients and 67% of high-dose patients not achieving significant pain relief. Oral colchicine can be associated with a very high rate of adverse events. About 80% of high-dose patients have GI side effects.These typically are diarrhea, nausea, vomiting, and abdominal cramps. Morris et al. in discussing oral colchicine therapy stated: “The side effects of nausea, vomiting, or diarrhea are particularly difficult to endure in patients who are in pain, incapacitated, and immobile from acute gouty arthritis.” Side effects are fewer with the low-dose,, although low-dose oral colchicine also can be associated with diarrhea, abdominal cramps, nausea, and vomiting.7 Borstad reported that 38% of patients treated with low-dose oral colchicine had diarrhea as a side effect compared with 4.5% of patients in the placebo group. The GI side effects from oral colchicine can be serious. The diarrhea can be severe and lead to dehydration and hospitalization. The majority of hospitalizations of patients with gout are associated with the use of oral colchicine. One of the reasons that oral colchicine can have serious adverse effects is that there is a strong potential for Drug-Drug Interactions (DDIs) with oral colchicine therapy. Colchicine is metabolized by the cytochrome P450-3A4 (CYP3A4) and transported by P-glycoprotein (Pgp). Co-administration with inhibitors of CYP3A4 or Pgp can lead to increases in colchicine concentrations in circulation. Since the concentrations at which colchicine is effective are just slightly below that which cause toxicity, circulating concentrations of colchicine can be raised to toxic levels by DDIs. The list in the Colcrys PI of drugs that can cause DDIs includes 26 drugs plus grapefruit juice., Oral colchicine can also cause rhabdomyolysis (myopathy) which can be exacerbated by concomitant use of cholesterol-lowering drugs that are associated with myopathy (statins and fibrates). This concern adds 8 more drugs (many of them commonly used) to the list of drugs with a potential for significant DDIs with oral colchicine. Colchicine toxicity is very serious and can have fatal consequences.2 One hundred and seventeen deaths have been reported for colchicine with oral, IV or intramuscular administration. Over half of these deaths have been attributed to DDIs. Corticosteroids are considered the last of the first line treatment agents due to the high oral doses needed and the likelihood of rebound attacks when the steroid is quickly tapered down. These drugs are most effectively administered as an intra-articular injection in a physician’s office or emergency room setting, quelling the inflammation but generating more treatment cost. ColciGel® is a first line agent in the treatment of acute gout flares and an alternative to oral colchicine in those patients who experience either adverse drug effects (ADRs) or who do not achieve suitable symptom relief. Considering that up to 80% of patients taking oral colchicine experience some level of associated ADRs, such as Nausea, Vomiting, Diarrhea, and or Abdominal Cramping,, and only 38% of these patients achieve a 50% or greater relief in pain,a href=”#_edn4″> patients and clinicians need a better alternative. ColciGel®, administered topically at the site of inflammation thereby bypassing the gastrointestinal tract (and associated ADRs), is that superior alternative. ColciGel®, developed by Gensco Pharma, is a 4X attenuation of Colchicinium, the homeopathic designation of colchicine, combined with a patented enhanced transdermal base. The hypothesis was that a low concentration of Colchicinium could be applied to the site of a gout flare, interrupting the inflammatory cascade and eliciting a positive clinical outcome without the adverse effects associated with oral colchicine formulations. This hypothesis was supported by earlier research demonstrating the favorable transdermal properties of colchicine and the effective mitigation of inflammation, secondary to monosodium urate (MSU) crystals, in animal models via a transdermal route of administration. The hypothesis has been validated by the following testing and clinical trials. Samples of the transdermal Colchicinium gel formulation were tested In-Vitro for drug release and diffusion across a synthetic skin model (Franz cell diffusion). The results demonstrated a high drug release rate and significant transmembrane diffusion (flux). Once the favorable in vitro characteristics of ColciGel® were established, animal testing to model the pharmacokinetic and safety profile of this drug began. Testing in rabbits, utilizing single and multiple high dose applications, produced only minimal serum presence and no signs of toxicity or dermal irritation. Extrapolation of this data to a human model indicated an expected serum level below clinical significance. Human PK testing was conducted in healthy volunteers utilizing single dose and multiple dose (dose stacking) applications of ColciGel®. Serial serum sampling resulted in no detectable presence of colchicine in any of the subjects. Again, there were no signs of toxicity or adverse drug reactions (ADR) including dermal irritation. These results support the belief that ColciGel® will not exhibit the same degree of drug – drug interactions (via the P450 3A4 hepatic enzyme pathway) and associated toxicities seen with oral colchicine. Furthermore, these results and the novel route of administration provides confidence in the assertion of minimal gastrointestinal (GI) adverse events, as are common in the oral formulation. A proof of concept test in a small cohort of patients13 with acute GF was conducted by physicians experienced in gout treatment. The results were impressive with all patient experiencing a 50% or greater reduction in pain within 48 hours of initial application and improved pain relief with additional applications. Many of these patients reporting a significant decrease in pain and inflammation within a few hours of initial application. None reported any ADRs including dermal irritation or GI distress. This preliminary data strongly supports the efficacy of ColciGel® in the treatment of acute gout flares. The next step for Gensco is a post marketing surveillance study looking at greater numbers of patients and sub groups for efficacy variations and incidence of reported ADRs. This post marketing open label study is currently preparing for launch. Please download the PDF for the full summary of ColciGel® research. Khanna,D., Khanna, P., et al. 2012 American College of Rheumatology Guidelines for the Management of Gout. Part 2: Therapy and Anti-Inflammatory Prophylaxis of Acute Gouty Arthritis. Arthritis Care & Research, vol 64; no 10: pp1447-61. Terkeltaub, R.A., et al., High versus low dosing of oral colchicine for early acute gout flare: Twenty-four-hour outcome of the first multicenter, randomized, double-blind, placebo-controlled, parallel-group, dose-comparison colchicine study. Arthritis Rheum, 2010. 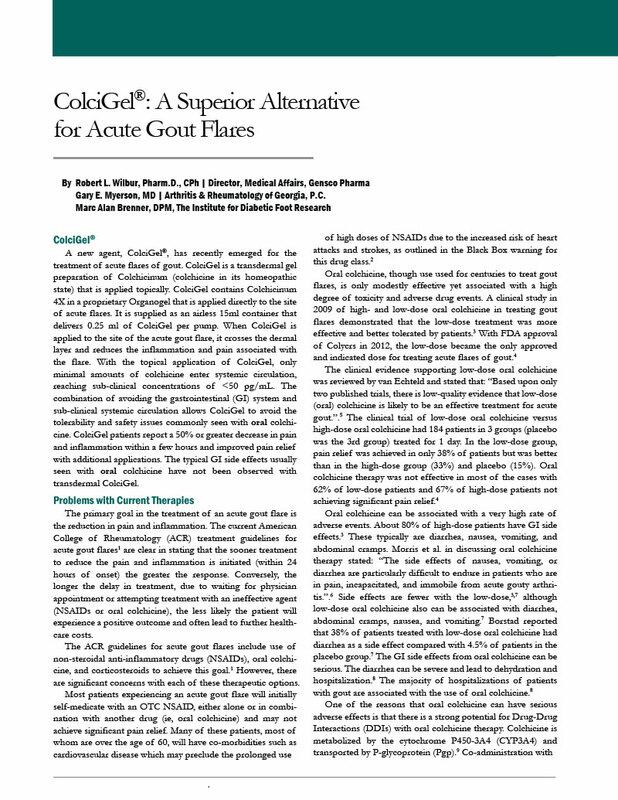 62(4): p. 1060-8.
 van Echteld, I., et al., Colchicine for acute gout (Review). Cochrane Collaboration, 2014(8): p. 1-41. Morris, I., G. Varughese, and P. Mattingly, Colchicine in Gout. British Medical Journal, 2003. 327: p. 1275-1276. Borstad, G., et al., Colchicine for prophylaxis of acute flares when initiating allopurinol for chronic gouty arthritis. Journal of Rheumatology, 2004. 31: p. 2429-2432. 8 Todd, B., et al., Assessment of the association between colchicine therapy and serious adverse events. Pharmacotherapy, 2012. 32(11): p. 974-980. Terkeltaub, R.A., et al., Novel evidence-based colchicine dose-reduction algorithm to predict and prevent colchicine toxicity in the presence of cytochrome P450 3A4/P-glycoprotein inhibitors. Arthritis Rheum, 2011. 63(8): p. 2226-37. Groff GD, Franck WA, Raddatz DA: Systemic steroid therapy for acute gout: a clinical trial and review of the literature. Semin Arthritis Rheum. 1990, 19: 329-336.